Quick, clear any mental cache you may have of the SsangYong Korando. From a company that was grabbing headlines more for producing “kill-it-with-fire” styled vehicles, here’s something that won’t turn you to stone when looking at it. The 2017 Korando is actually palatable—no, scratch that, it’s actually quite handsome any which way you look at it. The question is: is this Giugiaro-penned crossover’s beauty merely skin deep? As a refresher, the name “Korando” is actually an amalgam of “Korea can do.” And while that sounds like a catchy tourism slogan, it also tidily sums up the thinking that’s gone into the Korando’s history. From being a mere licensed replica of the Jeep Wrangler in the 80s to being built atop SsangYong’s first-ever monocoque platform almost 30 years later, the Korando has always been the one model with its eyes firmly affixed towards the future. That future though was in 2010. It’s hard to believe, but the current Korando has been out in other markets since 2010. Although a heavy refresh was done in 2014 adding modern tweaks (and some angularity in the process), the majority of the vehicle, especially the egg-like profile all harks back to a design language so prevalent 7 years ago. That’s not to say it looks dated though. On the contrary, the Korando still looks fresh. Some have chastised it for being overly generic, but it’s also this generic-ness that serves as its fountain of youth. Today, it looks handsome in a subtle, old guy sort of way. He’s Harrison Ford of crossovers—he may not be in his prime anymore, but he still managed to snag Calista Flockhart. And like a senior running on a cocktail of Viagra, the Korando brings with it one mighty and flexible blue pill: the powerplant. The figures tell only one part of the story since it is how that power’s delivered that makes the difference. The 2.0-liter turbo diesel motor in the Korando ELX (it is standard across the range barring the entry-level variant which uses a gasoline engine), has enough grunt for satisfying bursts of speed. In daily traffic, there’s enough shove to overcome the portly 1,692-kilogram curb weight. However, it truly comes alive as it hits medium revs making it a capable long-distance tourer. There’s some noticeable background drone once you start cruising on the highway, but nothing atypical of an oil burner. In terms of noise and vibration, it’s controlled enough to be labeled as comfortable. The accompanying 6-speed automatic though is another matter. The gearbox is good enough if and only if you don’t find yourself trying to prod it for more power. It shifts smoothly and leisurely allowing the Korando to build up its pace gradually. Bury the throttle though and the entire thing gets confused. Initially, it tries holding out that gear for a split-second longer than necessary only to overcompensate when it realizes the lack of pace by going two gears down. It does make an easy job of overtaking, but at the expense of having the occupants move about like bobble heads in the cabin. Plus, admittedly, you’ll probably expect a better than 7.35 km/L fuel economy reading from a small-engined diesel. Perfectly sized to tackle the Manila urban environment, the Korando opens up revealing a bigger than expected interior. Getting in and out is easier than most crossovers thanks to the high-set seats and tall roofline. Once settled in, the seats themselves are comfortable, perfect for spending a couple of hours in. It’s even more so in the second row where three adults seated abreast without complaints is possible. What’s more, there are various places to keep small items around and the cargo hold is enough for about two large suitcases with some room to spare for hand-carried luggage. Ergonomically, the Korando presents a learning curve with some buttons found in wayward locations. Still, once adjusted for, it’s all good; perhaps except for the Android-based infotainment system which washes out at the slightest hint of sunlight. As hinted by its timeless but somewhat generic exterior, the Korando’s interior is a mishmash of early 2010s and current design themes. The combination of high-gloss black and aluminum accents and matte wood trims may seem off at first, but they work well enough to uplift the otherwise utilitarian looking cabin. There’s also a fair amount of soft-touch plastics around the interior although it feels offset by the less than crisp plastics on the major controls and stalks. In as much as SsangYong has styled the Korando to look timeless, its 7-year shelf life shows in one important aspect: dynamics. As a reminder, the Korando is SsangYong’s first attempt at making a monocoque crossover, so driving this back-to-back with the Tivoli will show you how far they’ve gone since. As such, it has the tendency to crash over bumps you thought would have been otherwise ironed out. It hops and skips when beset with poor road surfaces, creating a less than comfortable ride for all the occupants. Now, the harsh ride could be forgiven if the trade-off would have been exceptional handling, but sadly, there’s not much of a pay off here. Push it even remotely enthusiastically, and it just won’t play. The steering itself is already slow to react, but add a chassis with pronounced lean and you’re left with a crossover that feels a size bigger. 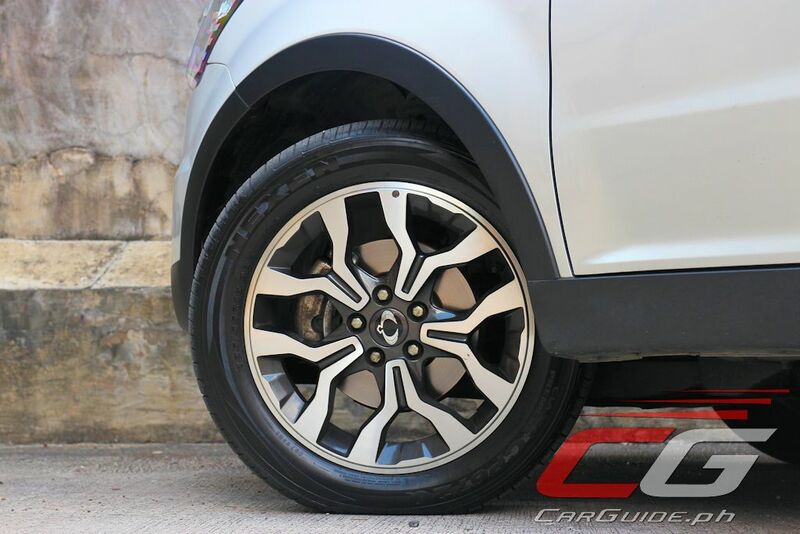 While it doesn’t set the bar for driving dynamics, putting on your sensibilities cap transforms the Korando into an interesting case. At P 1,390,000 for this range-topping model, it already undercuts similarly equipped rivals by around P 300,000 making it as a sensible choice for those looking for a 5-seater compact crossover. On top of that, it comes with an all-inclusive 3-year/60,000-kilometer PMS program (free parts and labor) and 5-year/100,000-kilometer warranty as well. The Korando is an outward sign that SsangYong’s on the right track. Though it’s let down by its less than great ride and obvious interior cost-cutting, you definitely see that it’s better than it used to be, and improving all the time. The timeless style, gutsy motor, excellent space utilization, and of course, the generous warranty program make it a pleasant surprise overall. It’s not going to be winning the compact crossover game just yet, but it’ll eventually get there. Soon enough, buyers will be in line for one of these and those days may not be for long. sir Uly, to go off topic and I sincerely hope for your patience. Will you be conducting a test drive of the honda brv? The vehicle will be bought before the onslaught of the excise taxes and we plan to keep it for a long time. Is it a worthy buy? We are seriously considering it as a competitor to the toyota innova. Many thanks. Hope to see it soon before we make the financial plunge into our first family car. Read. Mag-basa para alam mo. Read the article first, then comment. Yes, I already read it. I'm still sticking to my comment. If you want a diesel with much better ride than PPV, wither the Sportage or the Tucson is a much better buy than this.